It’s finally here! 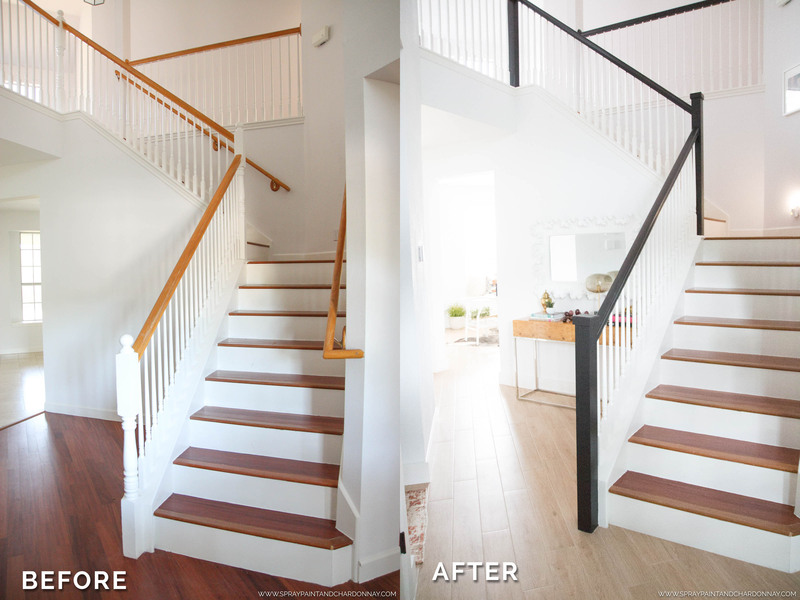 My first ‘BEFORE & AFTER’ post from the remodel! 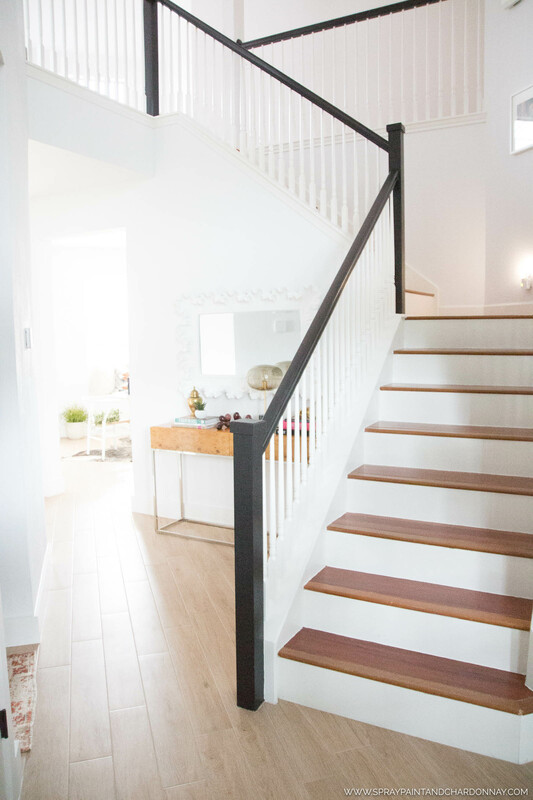 The staircase is the first thing you see when you walk through the front door, so I thought I’d make it my first post. And since it’s the first thing you see, I knew I wanted to make it a statement piece and bring it up to date. While there’s still work to be done to it, with just a few changes we definitely took it from being a 1990’s eyesore to a modern-meets-traditional show stopper. First, I should mention that I replaced all of the flooring on the first floor. 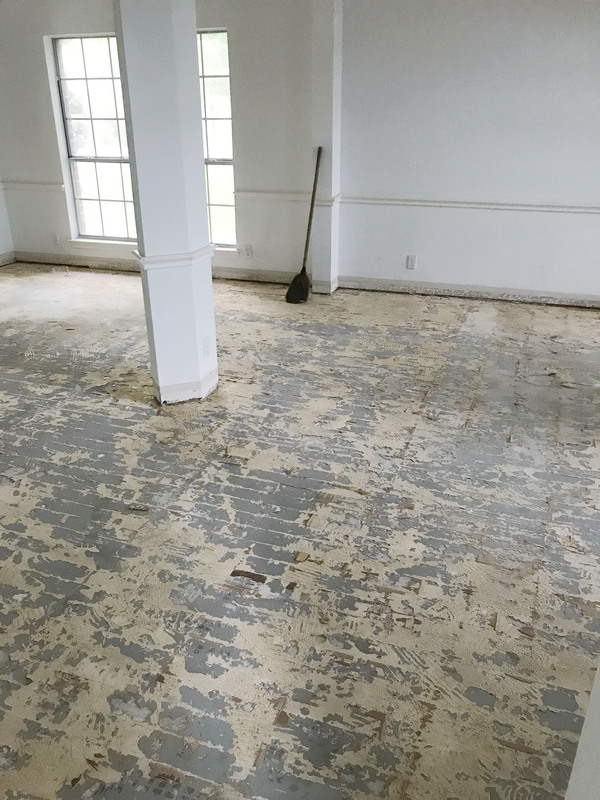 The front half of the house (entry, dining, etc…) had laminate wood throughout, and the back half (living room, breakfast area and kitchen) had a really darling 12′ x 12′ tile. And when I say “really darling”…I mean not at all. That all HAD. TO. GO. Secondly, all of these progress photos were taken on my iPhone during the remodel, so please excuse the poor(ish) quality. I ended up using a wood-effect porcelain tile throughout the entire first floor, except for the powder bathroom, and I couldn’t be more pleased with how it turned out. Choosing flooring was a major decision and it warrants its own post, so more on that soon. However, for inquiring minds, I used this 36″ x 6″ Summer Wheat Oak tile from Lumber Liquidators. 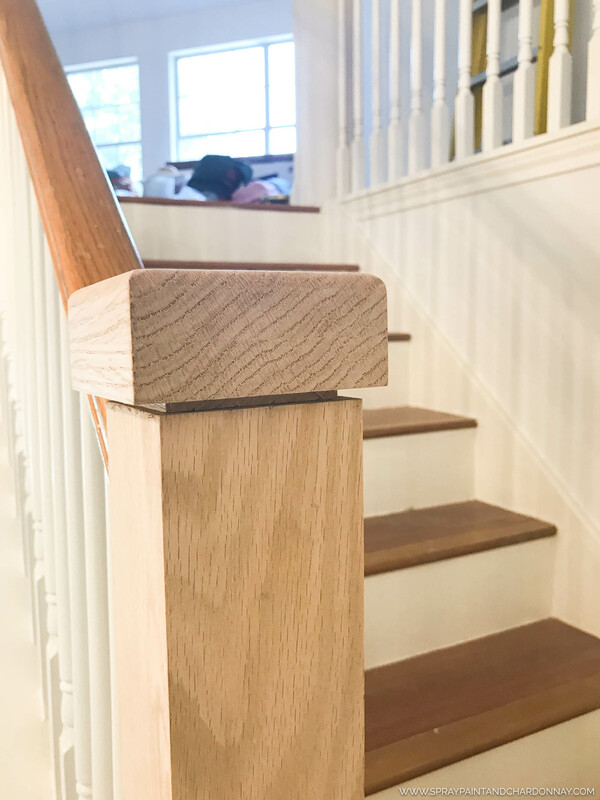 Spindles – little, skinny posts in between the newels. Now that you’re well educated, let’s move on. 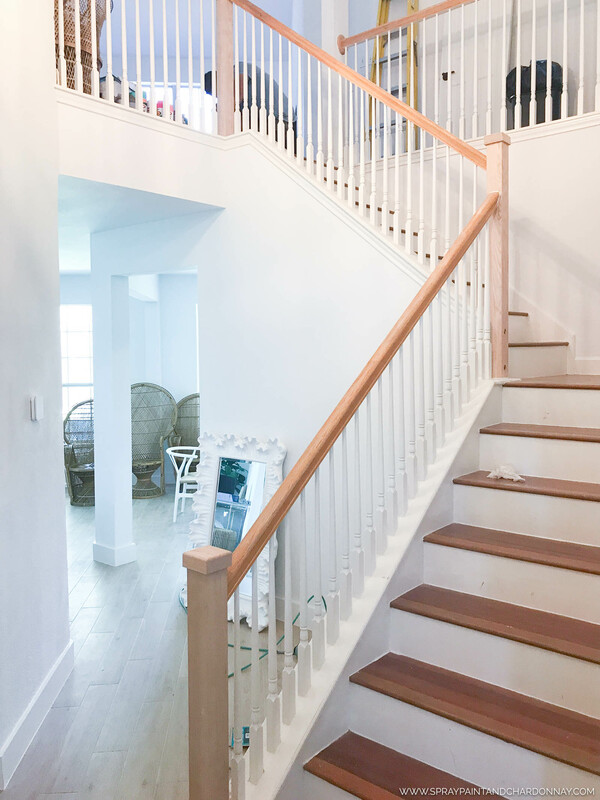 After removing the secondary hand rail, we removed the three original newels and replaced them with more modern ones that clean, simple lines. I ended up getting these from Amazon, but you can find them at any big box hardware store and they’re fairly inexpensive. 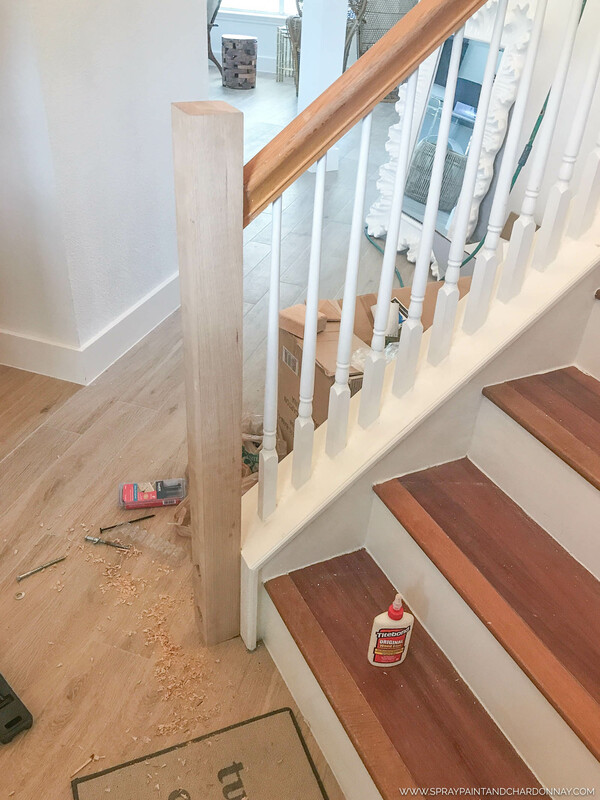 My NEW contractor had to cut the newel posts down a bit because the ones I ordered were a little too tall, but it was an easy fix. The posts also came with a couple of options for tops, but I ended up doing this simple flat top to keep the modern feel. I can’t take any credit or provide any helpful information for the constructional aspect of this project, as I was more of the “creative director,” but it’s sturdy and looks great. So, check! The whole process of changing out the newels took about an afternoon to complete. 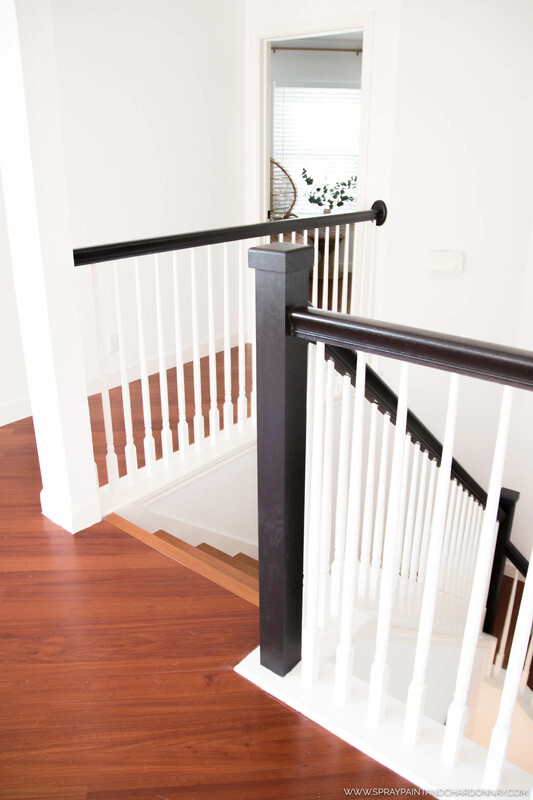 Once everything was in place and the wood glue had ample time to dry, we painted the handrail and newel posts black. I went with Sherwin Williams Caviar, because I thought it was their blackest black and didn’t have any tinges of blue or purple like some black paints tend to have. For the finish, my contractor suggested SW’s Emerald Urethane Enamel in Semi-Gloss, because of it’s durability and it can be easily cleaned since it was being used in a high-traffic area. So far its been great, and has the perfect amount of sheen. And there you have it! Since we had already moved in before this project was completed, totally replacing the treads didn’t seem feasible, in the budget, or beneficial to my sanity at the time, so that will have to be a project for down the road. They’re not in the greatest shape, but they get us from Point A to Point B, and honestly I can’t decide what I’d like to do to them. If I replace them and paint them black, I fear it will show every spec of dust and pet hair–and the constant cleaning would be enough to drive this OCD gal batty (see previous post). Since they’re currently laminate, it’s not really possible to refinish them either. 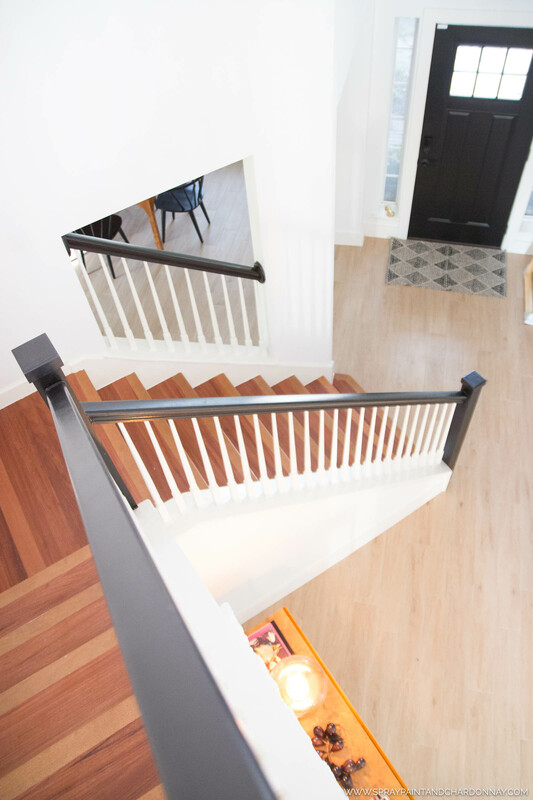 Then there’s also the option of a stair runner! There’s lots to think about it, but I love the (current) finished product regardless! That front door rug doesn’t live there. Don’t judge! If you have any questions about this project, or if there’s something I left out, please comment below! 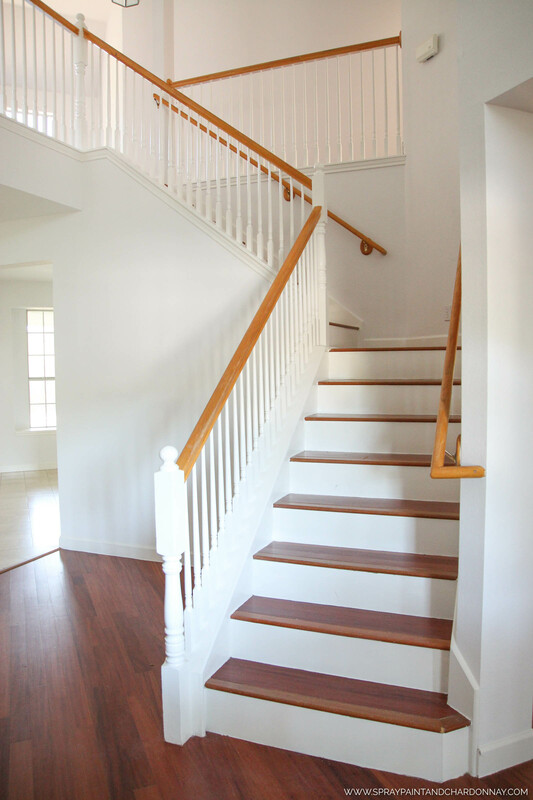 Have any of you refinished your stairs? Do you have tips, tricks, or suggestions? I’d love to hear from you! Amazing and stunning makeover. This is awesome, thank you for sharing this one! Wow, stunning results Katie – thanks for sharing! How much sanding did you have to do on the handrails before painting them with the Emerald Urethane paint? Thinking about using this paint for our stair handrail and want to make sure it holds up. My contractor did it, so I’m not 100% sure. The paint has held up really well so far. I’ve noticed a little wear on the little blocks atop the newel posts at the bottom & middle, but they’re easy to touch up!